At Ultimate Window Tinting we have 48 years of combined installer experience. When it comes to your buildings, you don’t have to bring them to us… we offer free on-site estimates. From a small storefront, to large commercial buildings, our expertise will get the job done right. Vista window film is a micro-thin composition of polyester and metalized coatings bonded by adhesives. If a window or glass door should break, the shattered glass tends to be contained within the Vista sheath, since Vista forms a protective “shield” across your windows. The film reduces 99.9% of the harmful UV rays, rejects up to 79% of solar heat, and reduces up to 87% of sun glare. This will reduce fading of furniture, woods, carpets, and valuables that are subject to fading. Along with improving comfort and offering significant energy savings, it is guaranteed safe for dual pane windows. peel, blister, crack, fade, change color, or delaminate. Vista is used and recommended by interior designers, and is also recommended by the Skin Cancer Foundation. Solar control films, such as Vista, should not be confused with the automotive black tinting film. Colors can range from virtually invisible, to reflective silver, frost, bronze, or other colors. Vista is proud to be affiliated with and recommended by the following industry organizations: BOMA International, AIMCAL, International Window Film Association, The Skin Cancer Foundation, Protecting People First Foundation, and ASID Industry Partner. Historically, most window films have provided only a summer solution on energy savings — a solution for only part of the year, but EnerLogic® low-e window film is different. It provides year-round energy savings through advanced technology. 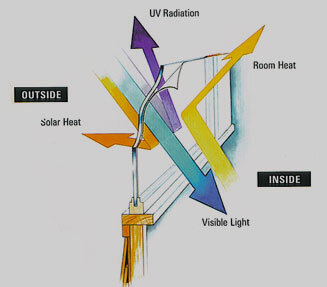 With the ability to reduce solar heat gain into buildings better than traditional window films with the same visible light transmission, EnerLogic® provides savings on cooling and heating costs, saving 15 to 30% on heating costs and 10 to 20% on cooling costs annually. and-grab robbers. Only LLumar security film comes with the patented crystal clear scratch-resistant coating on polyester films. Not only does the film protect your surfaces, it is optically clear and does not sacrifice function or aesthetics. In fact, every grade of thickness of LLumar Graffiti Film offers such transparency that vandals won’t even know that it’s there. The thickness of the film helps stop the glass from being defaced, while the scratch-resistant coating allows the vandals to think that they were able to get to the glass. It also provides care-free maintenance, because unlike other films, LLumar can be cleaned with everyday household window cleaning solutions. Through the unique adhesive that bonds to the glass, LLumar Graffiti Film remains attached to the window; binding the glass together and keeping it intact for much longer than most smash-and-grab robbers can afford to wait. This offers a powerful deterrent to robbers and saves you from major product losses. The film also reduces 99% of the sun’s harmful UV rays. This reduction dramatically reduces fading and deterioration of your in-store items. You’ll find LLumar Safety Films in every type of business establishment, including: department stores, malls, municipal transit systems, movie theaters, and office buildings. The most common items that business owners cover with graffiti film are showcases, windows, glass displays, bathroom mirrors, enclosures, subway windows, doors, elevators, and building exteriors.